Lensbaby lenses are made by a company that owes its success to bucking the trend in lens manufacturing. While camera and lens companies work to make sharper and sharper optics for their lenses, the people at Lensbaby are quite good at finding new ways of artistically softening an image with theirs. The results are new and interesting ways to create artistic photographs in camera..
I’ve been a fan of the Lensbaby idea for a long time, but my real connection with their equipment came with the release of the Velvet 56 lens. The name Velvet is perfect because the images it produces have a velvety softness and glow that is impressionistically beautiful. When this lens became available and images from it started showing up online, I bought one and fell in love with it. As it happens sometimes, other photography projects caused me to lose sight of this lens. That was until my friend and fellow photographer, Jane Palmer, posted some images on her blog after she purchased a Lensbaby Velvet 56. With Jane’s inspiration, I dusted off the Lensbaby and decided to reacquaint myself with this little lens. To challenge my creativity I went to photograph wildflowers. Flowers are not a regular subject for me. As a landscape photographer used to producing clear images, it was challenging to shoot wildflowers with the Lensbaby and not obsess over getting every petal perfectly sharp. How did I do? Photographing summer wildflowers in the New Jersey Pinelands usually means trudging through what a tourist brochure (if one existed) would call wetlands, but we Pineys call a swamp. Having a small compact lens like this one on your camera makes the job a little easier. Plus you get that beautiful Lensbaby effect. The Lensbaby Velvet 56 and applied textures in Photoshop can be a nice combination. While the dreamy and soft feel is the hallmark of the this lens, a little crusty texture seems to work well at times to enhance the painterly feel this lens produces. Here are some tips on using the Lensbaby Velvet 56. The Lens has a 56mm focal length which means it would be considered a normal lens, or a lens with a field of view that is similar to the human eye. It is a completely manual lens. While it works with most camera light meters, the f-stop and focus need to be set manually. The Lensbaby Velvet 56 is both a regular and macro lens. The lens has a maximum aperture of f/1.6. The wider you shoot with it, the stronger the “velvet” effect is. Above f/4 a halo forms around bright subjects in the photograph. If that doesn’t appeal to you, simply use the lens at f/4 or stopped down further. At smaller f stops, the “velvet” effect becomes minimal. However the bokeh (Out of focus background) if used in an image, can have an interesting circular look to it. When shooting wide open, it may appear that the image is not in focus, but if you look closely, you will find that the subject is quite sharp. This may be the way I relate to the lens, but outside of the images with textures, there is very little post processing in these photographs. In most images, only some contrast and saturation adjustments were needed. If you are not challenging yourself, you are not growing. As a landscape photographer with an obsession on clarity and sharpness, it’s nice to move in a different direction creatively. I’ve never been fond of photographing flowers, because the crisply sharp images I’ve obsessed over tend to be more suited as example photos for a guide book than artistic photographs. This little Lensbaby has opened up a new vision for my work with this subject. Challenging yourself as a photographer to think and create differently translates into growth for your creative voice. While I’m not going to sell all my other lenses, the Lensbaby 56 one will continue to help enhance my personal creative vision. Rich, These images are just wonderful!! I love the results you got from the Velvet 56, it truly is a spark for creativity!! It is a wonderful little tool to create with for sure. Thanks for the inspiration Jane. Beautiful images and changing a mindset from getting the sharpest to an artistic softness is a good lesson and reminder. Changing directions can show a side of nature that hadn’t been seen (or looked at) before. Awesome images! Thanks for your compliment and your thought. I like your point about this kind of lens being a vehicle to show nature in a new way. It’s kind of what artists like the Impressionists do. I’ve never been a big fan of the Lensbaby images I’ve seen and kind of set the brand aside as gimmicky. You’ve convinced me otherwise. Thanks Sara. I can’t say I disagree with you about the older Lensbabies. I had one of the originals and it never really worked for me. Some people can make them sing, but everything I did looked, as you say, gimmicky. However, This lens really caught my eye. If nothing else, I’m actually enjoying photographing flowers now. I love flowers and photographing them. I have been thinking of Velvet 56 for last 2 years but I would like to use my 100mm macro lens to the fullest first and then think of rewarding myself with Velvet 56. Thanks for the insight and inspiration, Rich! Thank you Anushka. Your compliment is greatly appreciated. I love flowers too. Who doesn’t, right? I just never liked my photographs of flowers until I started using this lens seriously. Thanks for the comment Ralph. 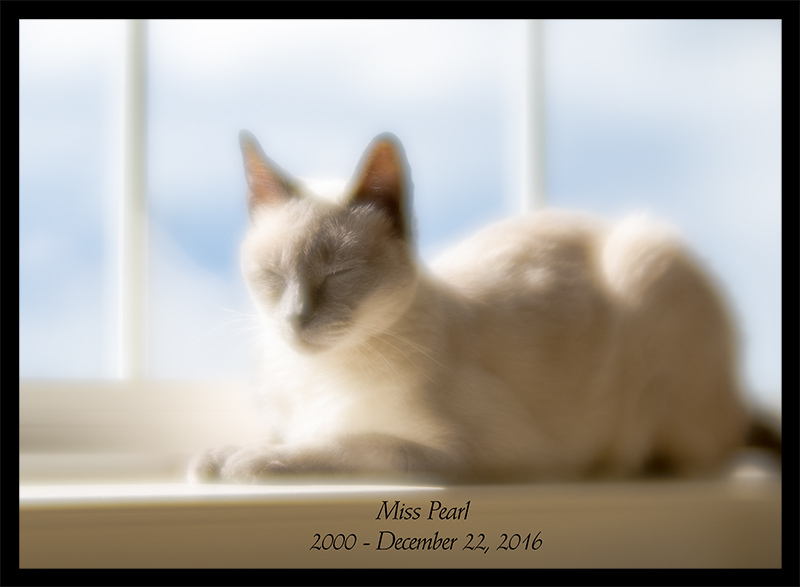 I remember that beautiful photo of Pearl. In fact it inspired me to do a portrait of a cat using the Velvet 56 which I was very pleased with. I agree with you that this lens is the most serious of their line. Heck, it actually looks like a lens. I’ve also become seduced by that etherial look which is unlike anything I’ve ever seen or have been able to create in Photoshop. Anyway, I feel like I’m just getting started with this one even though I’ve owned it for a few years. I’ve been eagerly awaiting this blog since I saw the Facebook teaser….as usual, you’ve exceeded all expectations! Thanks Elise. I appreciate you compliment a lot. It’s been an interesting creative journey with this lens. It works differently making me think differently. Nice work Rich, I love the lowers, and the fact you are challenging yourself. Thanks Lou. That lens is a nice challenge.